Sample Termination Letter For Poor Performance or simply the notice of termination is the notice generally provided by the employee stating the date on which employee’s contract of employment will end. He is going to leave the job or business for one or another reason. Employers want to write termination letter when they fire an employee. The sample employee termination letter for poor work quality confirms the details of firing and summarizes the information which new employee will need to know. The simple termination letter is an example of most simple and direct form of termination. You can use this termination letter in many instances such as when you want an employee to let go. It should be printed on company stationery or either handed to an employee at termination meeting. 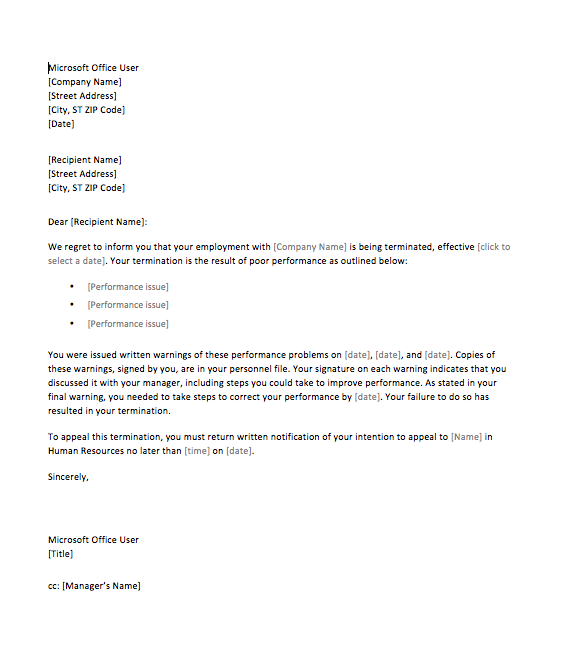 This simple termination letter does not provide the reason for termination. Termination letter also named as employment termination letter, pink slip, letter to fire an employee etc. -You’re an employer who needs to terminate an employee because of layoffs, poor performance or other reason. -Your company is terminating an employee and would like to have a record of the termination in the event of a lawsuit. BASIC DEMOGRAPHIC INFORMATION: Note who is being terminated, note company’s name, note the name if the person and his address. Note the dates too. REASON FOR TERMINATION: Give an outgoing employee a piece of mind review that why he is being fired. As mentioned the reason may be, you forced to layoff or some verbal abuse etc. as some situations are out of your control. LEAD UP: If you are terminating an employee under their control, make sure to know that how many times you have warned them and whether those warnings were verbal, written or both. COMPANY PROPERTY: Whether it’s a laptop, a company’s car, or just a key card you have provided to the employee, chances are they surely have been gifted with some company’s property. Make sure you will note if you asking for the property back. VACATION PACK OR FINAL CHECKUP: What you have to do pay your employee whatsoever he owed. Include what date they will be paid and when will be their last paycheck. HEALTH INSURANCE OR OTHER BENEFITS: if you have provided benefits like health insurance or retirement savings, make sure employee will know how you will handle this. Your work relation is over but your employee still has a future. Provide information to them about your continuing health insurance and when it will expire. Have your opening friendly but informal manner, clearly, state your intention to resign or state your reasons for leaving, give proper notice, thank your employee for the experience, wrap up your letter on a kind note, have a nice closing stay professional, read it again before turning it over. Thus this termination of employment letter within probationary period is not easy or fun to write but an important component of employment termination situation. It should be accurate, with common sense and reason. Finally, the dismissal letter provides documentation needed in the event of a lawsuit. And for more basic and impressive details you can download the templates regarding termination due to poor performance.